These Russian Dill Pickles are deliciously crunchy and refreshing. Perfect to accompany a sandwich or your favourite bbq meal! Really easy and quck to make in just 2 days. No canning required! This post contains amazon affiliate links which means if you make a purchase after clicking the link, I will make a small commission. 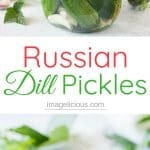 These Quick Russian Dill Pickles aren’t just another recipe, they are rooted in my childhood and ingrained in my memories. I couldn’t just write about the recipe without remembering. Feel free to skip all my musings and Jump to Recipe. Sweet and savoury preserves have a special place in Russian cuisine and culture. For centuries preserving summer produce was a necessity to survive long and cold winters. The geography of the country led to a plethora of vegetables, mushrooms, fruits and berries that only grew for a few short months and then needed saving. Russian-style sweet preserves are different from their Western counterparts. The jams, varenye, are often made with whole fruit suspended in beautiful jewel-coloured syrup. Even pinecones are preserved and made into jams and enjoyed throughout cold months. 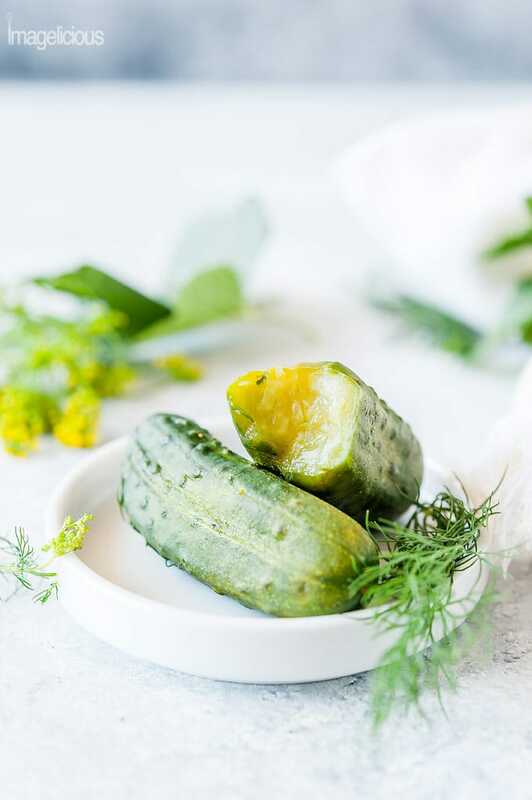 Russian pickles in most cases don’t use vinegar or too many spices and usually rely on lacto-fermentation and live bacteria to produce their characteristic sour flavour. With the advent of refrigeration and the beginning of easy import and export, the art of pickling started to die down in the 20th century. There was no need to preserve the vegetables not in season. A trip to a local supermarket would result in a few kinds of cucumbers and tomatoes, albeit not as flavourful, even in the dead of winter. Soviet Union, however, separated from the world by the Iron Curtain had a resurgence of pickling. The absence of food on the shelves made the pickles once again a necessity to provide just a few vitamins and nutrients in the winter. Popularities of Dachas, summer homes or cottages, that were given to people by the government, meant that people spent months growing food in the summer, foraging in the forest, and preserving just to have food on the table later in the year. My experience with all things preserved and pickled is not of absence but of abundance. Like many Soviets, my grandparents also had a Dacha. Our cottage land was a traditional 600 square meters (or 6,500 sq feet). Every square inch was filled by a flower or a plant. And in the middle of the plot, there was a beautiful two-story summer house with two bedrooms, one dining and kitchen area and a second floor with another bedroom. The rules of that time meant that the house could not be winterized. It was not allowed to have a washroom, plumbing, or running water either. Every year my grandpa would show me the blueprints of the house he wanted to built but was not allowed. Every year he would tell me a story of frantically packing tons of sand around the base of the house to artificially make it less tall for the inspection. His efforts helped and the second floor was actually tall enough that people could stand in it. That was also not allowed back then. My grandparents lived for that small piece of land. They spent winters making plans for what to plant and where to plant it. Changing it every year to make sure that they could efficiently grow as many vegetables and fruits and berries as they could. Bartering for new seeds and flower bulbs and stalks of different types of vegetables and flowers. Tending to the seedlings in the spring, dreaming, waiting. I spent summers at the cottage and even now, years and years later, memories made there are some of the most vibrant from my childhood. Grandma woke up at sunrise and spent hours before the sun got high and hot watering the plants, weeding, picking bugs and caterpillars off leaves. Midday was spent cooking and preserving. I was always allowed in the kitchen but never asked to help. I sat at the dining table, drawing, reading, playing, and watching from the corner of my eyes as grandparents pickled and canned. The house, surrounded by fruit trees and their shade, yet hot from the scorching sun and the steam of boiling water for canning, was filled with the characteristic aromas of salt brine and dill. Grandma cleaned, cut, and measured. Grandpa brought water from the well and carried jars into the cellar for fermenting. I know now that all those summer pickles and jams were made just so that I could have fruits and vegetables in the winter. I know it was done because there was absence of food in the stores. Yet, for child-me, it didn’t feel that way. I did not miss fresh cucumbers in December. Instead, I longed to eat those pickles made months earlier in August. I experienced the abundance of produce in the summer and abundance of love and care from my grandparents. Now, decades later, Dacha is a distant, yet eerily clear, memory. My grandparents died a few years ago and I miss them every day but never more than in the summer, when I pick black currant leaves to make my own Russian Dill Pickles from the recipe written by my grandma’s hand. When I smell the dill in the brine. When I bite into that perfect lightly salted cucumber and hear the crunch. I want to say thank you. I want to say I remember you. In North America, pickling most commonly, although not always, means that vinegar is used as one of the main ingredients. Russian-style pickled vegetables most commonly, although also not always, use just a salt brine. The process creates active and live cultures and the vegetables undergo lacto-fermentation. 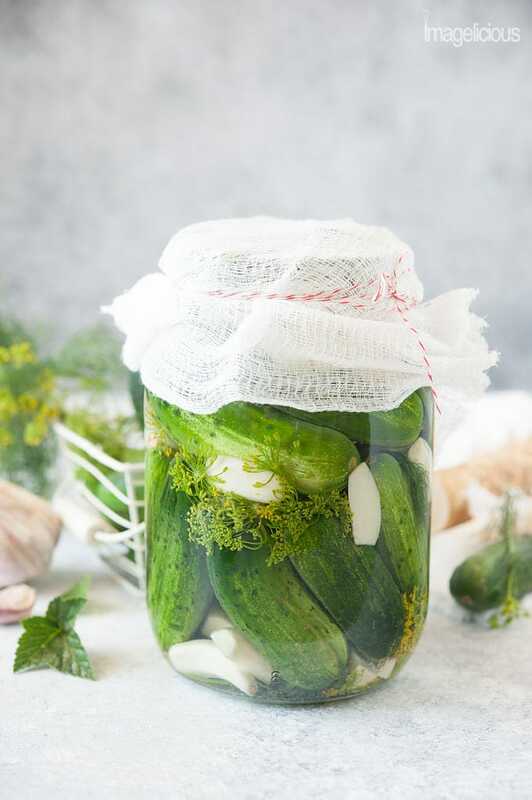 There are different ways of lacto-fermenting vegetables and all of them are popular enough that they each have a different name in Russian. We don’t just pickle vegetables. We also pickle fruits. There’s usually a very low salt to water ratio for the brine but pickled fruits like that can also last for a long time. Pickled apples are a childhood favourite. Pickled watermelon is still something I can’t get on board with. My Canadian husband loves telling a story about his first visit to a Russian restaurant with me. The table, as tradition dictates, was filled with dozens of dishes of appetizers, zakuski: herrings, salads, blini, caviar, cheese, deli. In the middle there was a big platter of beautiful fruit: slices of watermelon, small apples, bunches of grapes. The shock of biting into a grape after grape after grape and discovering that they all “spoiled” was visible on his face. Learning that the fruit wasn’t actually spoiled but pickled instead is still something he recounts with horror a few times a year. Lacto-fermenting summer crunchy cucumbers turns their flavour beautifully sour and intense. Those pickles are often canned and preserved at the height of the summer. They are usually ready to eat 2 to 3 months later. And if canning is mostly something that is done at a cottage, making Quick Russian Dill Pickles is a very common affair for most Russian facilities. The direct translation of the name is Low-Salted Cucumbers. I’ve seen recipes that refer to them as Half-Sour Pickles also. These Russian Dill Pickles are deliciously crunchy and refreshing. Surprisingly, a cold half-sour pickle on a hot day quenches thirst. They are perfect to accompany a sandwich or your favourite bbq meal! They are also very quick to make and require no canning, making them great for cooks of any level. 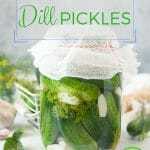 How to make Quick Russian Dill Pickles? Making Quick Russian Dill Pickles is very easy. It requires no special equipment or fancy ingredients. There are a couple of ingredients that make the pickles a bit extra special but they are optional. 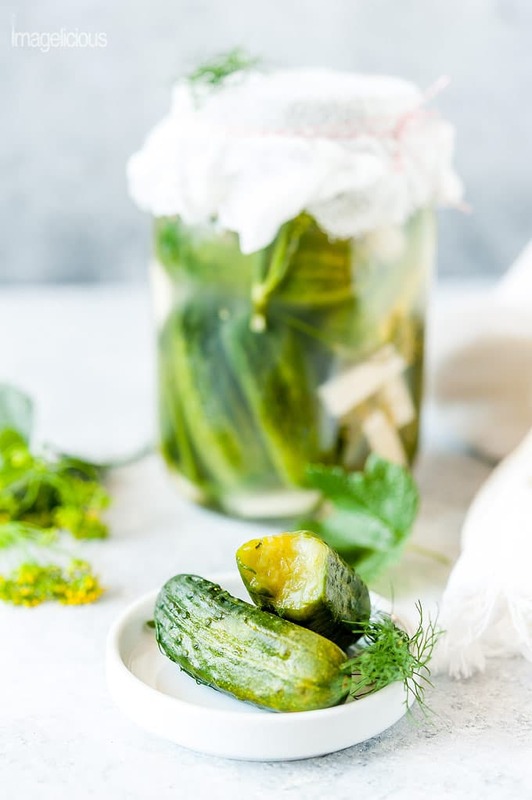 To make Low-Salted Russian Dill Pickles you need to pack small cucumbers in a jar with garlic and flowering dill and cover with a salt solution (brine). Let the cucumbers ferment on the counter for two days. They will be done after 48 hours. Then just keep the jar in the fridge. Easy! Don’t forget to watch the video where I explain all the details on how to make these delicious Quick Russian Dill Pickles!! Cucumbers: you need the ones that are bumpy and small, the smaller the better. Sometimes they are called dill cucumbers at the farmers markets. Most likely they are Kirby Cucumbers or Garden Cucumbers. I have seen recipes that use any kind of cucumbers including English or Turkish Cucumbers but I haven’t tried them. My guess that any old cucumber would work but I prefer the summer bumpy ones. 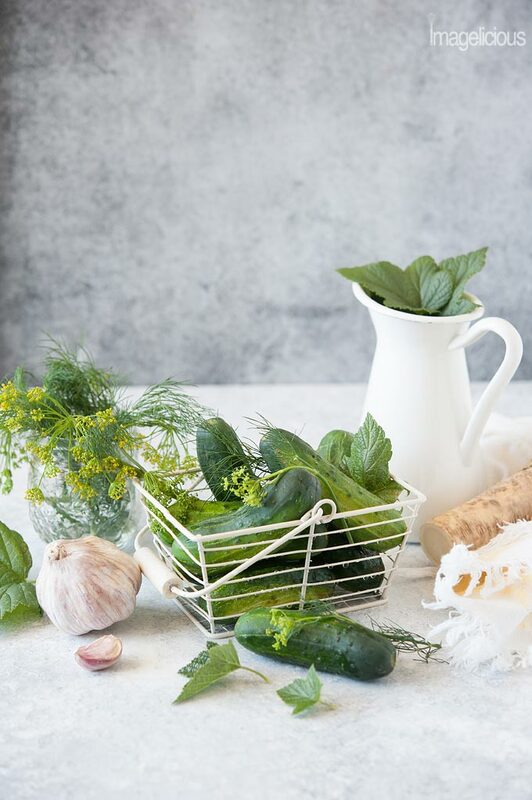 If long English cucumbers are the only ones you can find, you would need to cut them into smaller long spears, similar to the size of small garden cucumbers. The time to ferment might be shorter since there will be no skin to penetrate for the acid. Flowering dill: this is one of the main ingredients as it provides a characteristic dill flavour to the Russian Dill Pickles. I mean, they have Dill in their name! 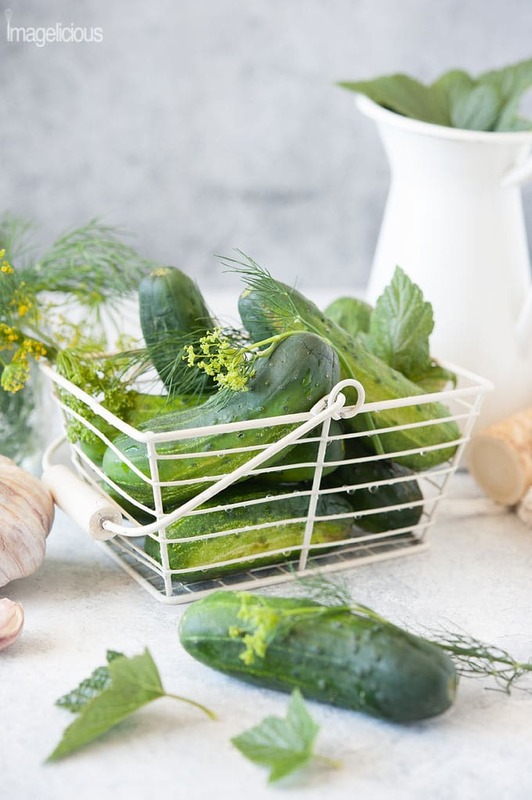 You can usually find flowering dill sold in long stalks in specialty stores or farmers markets right next to cucumbers. I have seen some Russian recipes for Dill Pickles that use just regular dill, not the flowering kind. I personally have not tried using regular dill but it should still work. You might need to use more dill than the flowering dill to impart more flavour into the brine. Garlic: another crucial ingredient. It adds flavour to the Dill Pickles. You could possibly omit it but again, I haven’t tried doing that. You don’t eat the garlic, so don’t worry about garlic breath. Horseradish root: this is an optional ingredient but highly recommended. Fresh horseradish root adds a little bit of bite to the resulting pickles. They will have just a bit of a sharp edge to them – absolutely delicious! Horseradish root can be found in most grocery stores or farmers markets. If you don’t have fresh horseradish, do not add a horseradish condiment. It is not the same. Black currant leaves: another optional ingredient but something that I always use now that I have a black currant bush in my backyard. My grandma used to say that the black currant leaves make the pickles extra crunchy. I have seen recipes using horseradish leaves also but I have never tried that since I don’t know where to get them. Brine: I use a simple brine of 4 cups of water and 1.5 tablespoons of sea salt. My other grandma uses 3-4 tablespoons of salt which in my mind is pretty inedible. 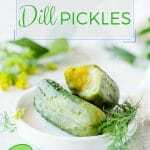 I would suggest trying this Dill Pickles Recipe with 1.5 tablespoons of salt first and then increasing half a tablespoon at a time if it’s not salty enough. Just remember, this is a recipe for Low-Salted Pickles, so they should not be overly salty. Additions: some people add bay leaves, coriander seeds, cloves, peppercorns. I don’t. What equipment do you need to make Half-Sour Dill Pickles? I use a big jar from pickles that I bought a few years ago. If you don’t have a jar you can use any container that you have that has a lid for storing in the fridge. How long can these Quick Russian Dill Pickles be stored? 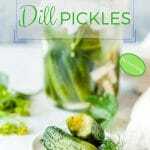 This Pickles Recipe is specifically for Low-Salted Dill Pickles (or Half-Sour Dill Pickles). As such, the pickles shouldn’t be stored in the fridge for more than 7 to 10 days. They will get progressively saltier and saltier as the time goes by. The brine looks cloudy! Are the pickles spoiled? NO!!! In fact, you want the brine to change colour a little bit. There will be a foam at the top of the jar and it’ll turn a bit white and cloudy. This is exactly what you are looking for! It is the sign of fermentation! 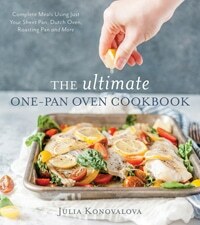 If you like Russian recipes, PRE-ORDER my cookbook, The Ultimate One-Pan Oven Cookbook, it has quite a few recipes inspired by my childhood favourites. Boil 4 cups of water and dissolve 1.5 tablespoons of sea salt in the water. Set aside to cool. Optionally: trim the ends off. I don't usually do that. Peel the garlic. Cut bigger garlic cloves in half. If using, cut about 2 inches off the fresh horseradish root (about 60 g). Peel using a potato peeler. Cut into small pieces similar to the size of garlic cloves. In a clean 1.5 litre jar, lay a couple flowering dill heads, a couple black currant leaves, if using, drop a few pieces of garlic and horseradish. Add the cucumbers standing vertically. Add a couple more flowering dills, black currant leaves, a few pieces of garlic and horseradish and another layer of cucumbers. Scatter the rest of the cloves and horseradish around and cover the cucumbers with the remaining flowering dill and black currant leaves. Pour the brine over the cucumbers making sure that all the ingredients are fully covered. Place the jar on a plate to catch spills if the jar is very full. Cover the jar with cheesecloth and keep on the counter to ferment for 48 hours. After 48 hours the brine will start turning cloudy and there will be a bit of foam at the top. It is exactly what you are looking for. It does NOT mean that there's anything wrong. The pickles are NOT spoiled. The Low-Salted Quick Russian Dill Pickles are now ready to eat. Cover the jar with a lid and keep in the fridge for 7 to 10 days. Depending on the size of the cucumbers, I can usually fit between 1.5 to 2 pounds of cucumber in my 1.5 litre jar. Usually smaller cucumbers are easier to pack than the larger ones and I can fit more of them by weight. These are Low Salted Russian Dill Pickles, so I use only 1.5 tablespoons of salt to 4 cups of water. For a saltier version use more salt. Try with 2 tablespoons of salt if you'd like. If you don't have a 1.5 litre glass jar, you can make these pickles in a bowl or a soup pot. You might need to make more brine to have all the cucumbers fully submerged. Place a plate directly on top of the cucumbers while they are fermenting on the counter. You want to make sure that there's not a lot of direct contact with air and the brine. NOTE: The nutritional values are calculated by a plugin and they include the brine in the sodium content. The brine will not be eaten. Loved this recipe, especially your beautiful photos (they motivated me to do this myself!). Thank you for sharing! This is a most beautiful story I have heard surrounding a pickle 🙂 I love how clear and vivid your memories of your grandparent’s kitchen are, what a great way to grow up, and what a great way to earn some gratitude for the food you were given. Cannot wait to try this recipe out! 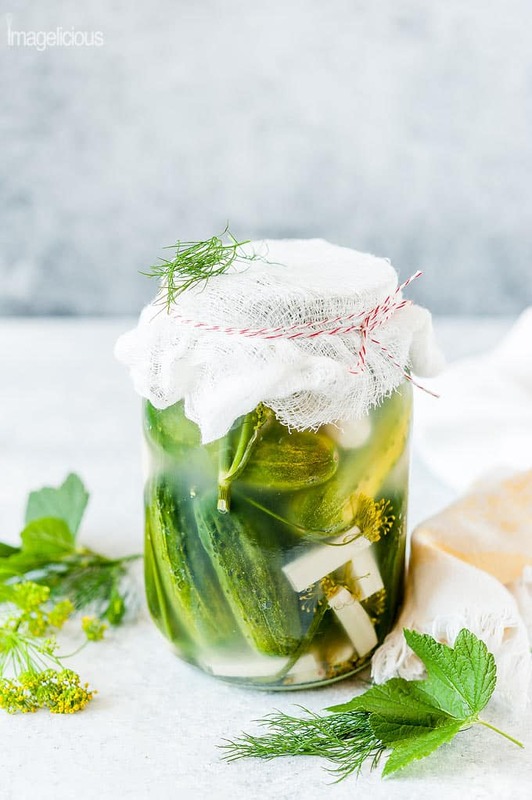 Love the recipe, love the reminiscences of your grandparents and their wonderful (and sneakily tall) Dacha, and I definitely love Russian pickling! I’m a big fan of all things preserving, but I often find that there’s too much of a focus on sweet and not enough savoury in popular pickles and preserves. Likewise, while I enjoy a vinegar pickle, I find that they can be a bit overpowering at times. When I first learned about Russian pickles and pickled/salted watermelon in particular, I was smitten. I mean, it’s fantastic stuff – and so much more versatile than a pantry full of jam (and I say that as a man who makes his own jam). Oh and I love that you used horseradish and black currant leaves! Yay! GIRL. I had no idea you could preserve pinecones!? That’s so so interesting. I imagine it would bring an almost rosemary-like flavor to your food? I’d love to see what Russian pickles taste like. I can’t imagine those suckers NOT being all vinegary and briny, but I bet yours are just as delicious! Thanks for sharing these memories, Julia. I embrace my own nostalgias, and I love hearing other people speak fondly of their own. I’m definitely going to give these a go. I’ll probably wait until next year since we’re moving soon and new projects seem like a bad idea right about now, but I can’t wait. I’ve always wanted to get into canning but am so so afraid, what with botulism and all. Lol. My Dad cans hot peppers and I’ve helped him before, but I’m just not overly confident in my abilities to go solo yet. 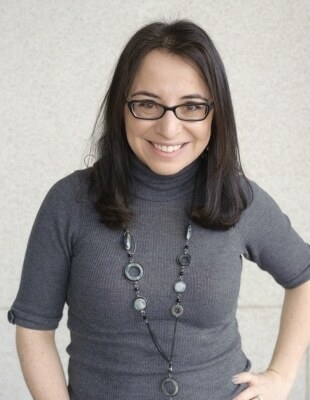 I loved your story!! My parents went through much of that in Northern Italy. We had to leave our home in the dead of night because our land was given to Tito and his horrible regime. I grew up with parents that valued every bit of food and nothing was wasted. I was too little to remember the escape and the reason. Now, to the pickles — we love dill and avoid sweet ones like the plague. Will have to try your recipe. I love your story about your grandparents – I remember you mentioning that when we went on the mushroom canada’s tour together. It’s always interesting to hear about how other generations grew up – I never got the chance to ask my grandparents about their lives so thank you for sharing your summers with your grandparents’. The story about your grandparents actually made me tear up. Food memories get so rooted in us. I laughed too, when reading about adding the sand to hide the second story. So resourceful, but crazy that those laws were on the books. The pickles sound wonderful. We’ve actually been experimenting with different homemade pickles at my house, so I’ll have to give yours a try. Hey Julia, what a lovely story about your Summers with your grandparents. I really enjoyed reading about your grandpas hopes and dreams and their lovely, efficient gardens. The Russian system makes no sense to me doing the cold war. I’ve heard some sensational stories. Your story of Summer dachas is another one I won’t forget. I think you can use grape leaves for pickles to give it that extra crunch and those might be easier to find. I think it’s the tannins that do it. Thanks for this lovely recipe and family memory! Love the story. My baba, mom, and aunts had LARGE gardens. I have one aunt that had a fruit orchard. LOTS of canning happened ALL the time. Our fruit cellar in the basement was always full of jars. My mom made all her own pickles. Unfortunately, the “canning” ritual did not get passed down to me. However, when you can do “quick pickling” that is my kind of pickles. Julia, I love your desciption of the dachas and your summers in Russia with your grandparents. Actually, I just finished a Ken Follett novel and it went into great detail about the government dachas, so hearing about your experience is fascinating. I’ve never actually made pickled vegetables before, but my Aunt Donna did this every year and we always enjoyed the fruits of her labor. Your recipe with the horseradish sounds like it would be really punchy and addictive. 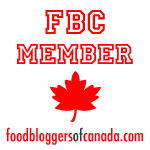 Where do you find black currant leaves? Is there a retail source? I’ve never seen them in my market.